Just a couple of bits i knocked up for the nipper some months back. Imported this aluminium rear sprocket and lightened it further. New bearings front sprocket and decent chain while at it. He keeps dropping off now need to replace 2nd time the clip ons. Nice Job! But I'm having a hard time seeing the rest of the bike in those pictures? Is that a front sprocket guard? What bike? Its only a little one for the nipper. Gilera SC125 the 2 stroke not the later 4 stroke. 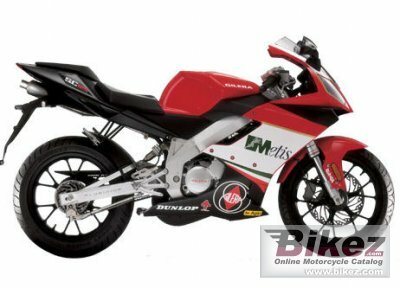 Otherwise branded as Derbi GPR125. Eric it is a front sprocker sort of cover, dont know how legal as you could get your fingers in. Its about the only thing he hasnt broke, oh and the JollyMoto. I don't know whether you legally need a front sprocket cover, I haven't bothered using one for ages. Can't see why you would as you can easily chop your fingers off in the rear sprocket on lots of standard bikes. Nice parts, I don't like aluminium sprockets though, they wear out like toffee, even hard anodised do not last. I far prefer normal steel ones from JT, especially considering how small a weight loss there is. Seems a bit of a waste to put such nice parts on an 'orrible 125 too. Not my bike its the nippers. Italian magic with DTR Jap engine, light and nippy running around 28hp as is. Would be nice with a CR or KX500 engine in. The aluminium rear was made in the US, i imported earlier this year. 1/3 the weight of the crap steel one, then lightened. 1k no sign of wear whereas original steely had it at 3k. Got an asian build JT sprocket on front. Very nice. They are just the sort of thing I'm looking to make. What tools did you use for that? This thread reminded me of comic strip from the 1950's. Hot Rod Magazine had a cartoon character named Stroker McGurk, In one issue of the magazine the state of California, home of some wild hot rods, had passed a law requiring fenders on all vehicles weighing more than 1500 lbs (680kg). The first frame was Stroker reading the law, the second he was busy drilling holes in the frame with a hole saw, the third showed the "rod" on the scales showing a weight of 1498 lbs. In the last frame his girl friend jumped in the car and it collapsed!! Not to say your work is in danger. Just that it allowed an old man to reminisce.